Jack Le Funk, Duran Genc, Aytekin Kurt, Incognito Feat Jocelyn Brown, Dr Packer, Orlando Johnson & Trance and more. This show was 6th in the global bootleg / mash up chart and 61st in the global nu-disco chart. 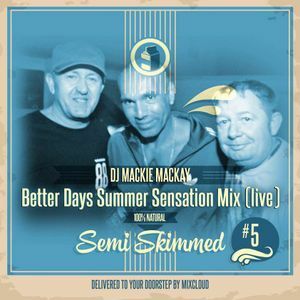 Here is the 5th version in the semi skimmed series recorded live at betrays summer sensation pre party aug 2015 where we had a nice afternoon session for the main event with David Morales, Jocelyn Brown, Danny Rampling, Grant Nelson and local heroes of all things house Dean Baker & Andy Moody. This mix will be going out live on my sat night radio show on groove flow radio.. Thanks mate hope ya ok buddy ain&apos;t seen you for ages. Thnk you, check out the love lounge mix too..